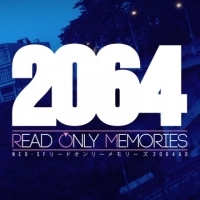 Box Text: 2064: Read Only Memories is a cyberpunk thriller that merges classic adventure gaming with ultramodern storytelling. A struggling journalist turns reluctant detective, teaming up with the world’s first sapient machine. Together they will uncover a shocking conspiracy that could shake the foundations of Neo-San Francisco. 10-08-2018 markus Box Text 2064: Read Only Memories is a cyberpunk thriller that merges classic adventure gaming with ultramodern storytelling. A struggling journalist turns reluctant detective, teaming up with the world’s first sapient machine. Together they will uncover a shocking conspiracy that could shake the foundations of Neo-San Francisco.